Your honeymoon is perhaps the most important holiday of your life, the one you’ll want to remember forever. Romance, indulgence, beautiful settings, starlit skies, special moments…. these are the best ingredients for creating unforgettable memories to be cherished in the years to come. The Okavango Delta in Botswana is one of Africa’s most romantic destinations for an African safari holiday. Drifting silently on a mokoro, a local dugout canoe, along a seemingly endless labyrinth of waterways spotting the tiniest of frogs and the hugest of hippos is just one part of its magic. The birdlife is spectacular with over 400 species and the wildlife is mesmerising. Its residents include lions, giraffe, wild dogs and hundreds of elephants. Here’s a great 8 day Botswana Honeymoon Safari that you might want to add to your shortlist. For one of the most memorable honeymoon safaris, stay at Baines Camp and walk hand in trunk with two elephants that were reared by zoologist Doug Grieve after being orphaned as youngsters. It’s a deeply moving experience. Stroke their tusks, feel the wiry hairs that cover their hide and learn all about their characters and behaviour. There’s an added feel-good factor too: money raised goes towards educating local children on how to live with their sometimes troublesome pachyderm neighbours. Back at camp, enjoy a candle-lit bubble bath on your private terrace and sleep under the stars in luxurious star-beds. Honeymoon safari at it best! Can you imagine? Dinner by the pool. 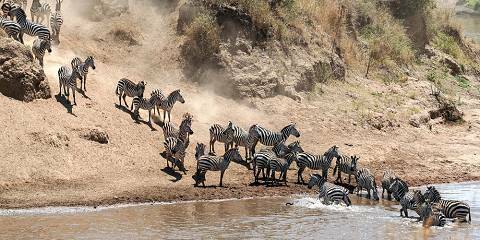 Check out Baines Camp of Yellow Zebra Safaris. Kenyan Maasai Mara safaris have a reputation for being busy and crowded, particularly during the Great Migration when millions of wildebeest and zebra stampede across the plains from the Serengeti. But it is possible to escape the hoards and simply relish its beauty. If you love nostalgia, check out Angama Mara, a contemporary-chic lodge high on the Rift Valley escarpment. Evoking the romance of a time gone by, it lies on the site where the classic movie Out of Africa was filmed. Staff will prepare a sumptuous champagne picnic at sunrise or sunset at the very same kopje where Robert Redford and Meryl Streep posed for its famous poster. Or glide above the Mara River in a hot air balloon and descend to a champagne breakfast. By staying here, you contribute to the lodge’s Foundation that works with local communities on education, healthcare and conservation. As memorable moments go, gazing into the eyes of a silverback gorilla deep in the rainforest must be at the top of the pile, and what better time to do this than on your honeymoon? At a cost of US$1500 for a tracking permit, spending time with these beguiling beasts in Volcanoes National Park in Rwanda, is a pricey yet priceless experience. This is the ultimate wildlife encounter, and it needs to be shared with someone special. 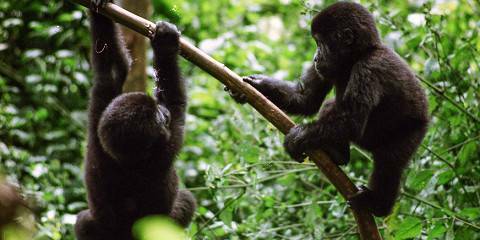 It can be a tough hike to reach the mountain gorillas. You will hike through dense jungle or bamboo forests and you’ll have just one hour in their presence when you reach them. But that hour will fly by, watching young gorillas swinging through trees, playing and squealing while mums gently nurture their babies and the big daddy silverback keeps an eye on them all. When your time’s up, stay at Volcanoes Safaris’ Virunga Lodge, named ‘Africa’s Best Romantic Retreat’ at the World Boutique Hotel Awards. With awesome views spanning the park’s lakes and the imposing volcanoes of the Virunga massif, it’s difficult not to fall in love with this idyllic place. 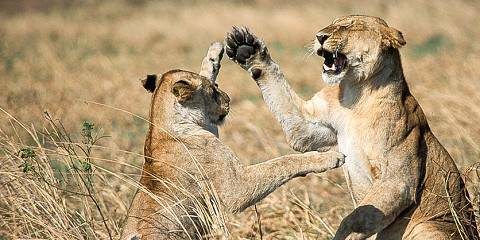 Tanzania is deservedly the most popular destination for an African safari holiday and promises an unforgettable honeymoon. Be amazed at the world’s most spectacular wildlife phenomenon as masses of wildebeest migrate on their centuries-old cyclical route from the Serengeti into Kenya’s Masai Mara in search of greener pastures. And take in spectacular views of the world’s largest intact caldera, Ngorongoro Crater, home to some 30,000 wild animals including the Big Five, from the terraces of the romantic AndBeyond Ngorongoro Crater Lodge. Masai Mara, balloon in the back, wildebeests in front. Image by Hardholt/Bumihills. Then fly over to the exotic Spice Island of Zanzibar, lose yourself in the narrow alleyways and Swahili culture of Stone Town and laze on the white-sand beaches of Matemwe, Jambiani or Bwejuu. But for the ultimate indulgence, head to Zanzibar’s little sister, Pemba Island, and stay in a unique underwater room at The Manta Resort, with the romance of the Indian Ocean all around you. Underwater Room of the Manta Ray Resort, the ultimate honeymoon experience. If you’re after blissful solitude on your African Safari holiday or honeymoon, and a true back-to-nature experience, then look to South Luangwa National Park in Zambia. The birthplace of walking safaris, South Luangwa offers extraordinary up-close and personal experiences without the confines of a 4X4. As you walk through the bush, you smell, see, touch and hear things you would never encounter in a vehicle. Your senses go into overdrive, connecting you with nature in the most beautiful and basic of ways. You’ll never forget the thrill of tracking elephants on foot, always staying downwind to ensure they don’t pick up your scent. Or waiting, crouched down in silence, in hushed anticipation for a leopard to return to its kill stashed safely in the boughs of a tree. Stay in beautiful, rustic lodges that don’t skimp on luxuries. Or for a true bush vibe, walk to a new location every day and stay in simple fly-camps. Then head to Livingstone and treat yourself to a helicopter flight over thundering Victoria Falls, marvelling at the power and beauty of the mighty Zambezi. Angama Mara view from the pool, picture by Yellow Zebra Safaris. Find your perfect honeymoon safari on SafariBookings.com! Check out some more romantic safari ideas and find the perfect African safari holiday for your honeymoon at SafariBookings.